I figured it was about time to start one of these threads. I'm not terribly prolific, so this may be a sparse thread, but I wanted to share various things I've created in HitFilm, both personal and (pseudo-)professional. Some of these are finished products, while others are just random tests/experiments. I'll post some older work in a bit, but my latest creation is a simple animated logo. I do a little work on the side for a friend who runs a horse ranch offering trail rides, riding lessons, etc. I've had random thoughts in my head about animating the ranch logo, and finally sat down and cranked this out in a few hours. @jsbarrett Turned out very nice! One thought that crossed my mind on the second watching was since the letter "B" flips up to become the bow what would it look like if it was at the left side and became the "B" in the word Broken? If carefully positioned the arrow could then underline the rest of the word "roken." Just random musings; it doesn't need any changes though. @tddavis: Thanks! I'm not sure I'm picturing the alternate setup you described, though. I had to work with the logo as it was originally designed, and I'm not sure how I'd get the arrow in its final position if it's traveling on a path to underline "Broken." @OliThompson: Thank you very much! Here's my next share, this time from the archives. I made this almost exactly a year ago, originally for the Vine platform (hence the square shape). There's a wonderful rivalry between FC Dallas and Houston Dynamo (both MLS teams in Texas), with "Crush the Orange" being a popular catchphrase used by FC Dallas fans. I can't remember what inspired me to go for the glitchy editing approach to this piece, but I definitely had fun exploring HitFilm's effects in the process. Before getting to the gist of this post, I thought I'd toss out a little backstory. I left Reel FX in the summer of 2012 to pursue other work, and now primarily do freelance/contract work in the realm of sports marketing and promotions. I also teach an online class through AnimSchool for beginning users of Maya, which I've been doing for the past four years. Back to the present, I'm starting to gather and produce HitFilm tutorial ideas, so I figured it was time to come up with a "production entity" name of some kind, though realistically this is probably not going to be much more than a glorified hobby, as my primary line of work is in a completely different field. While drafting my first tutorial script, I wanted a clever tagline to use at the end, but couldn't think of anything right away, so I just wrote, "Until next time, clever tagline," thinking that I'd replace it later. The more I read it, though, the more I liked it as it was, so I decided that the name of my pseudo-company will be Clever Tagline. Next came the logo. For logo treatments, I'm a big a fan of stuff that's simple and clean, so I knew I wouldn't be using HitFilm's flashier effects. After fiddling with things for a few days, I've come up with something I like. I wasn't originally aiming for a realistic look, but it gradually went that direction as I played around. The instant I read Clever Tagline the first time I said to myself, "Self, he should just use Clever Tagline because that's awesome!" Yeah, "Clever Tagline" for the win. And a simple logo card with a faked rack zoom and the sound effect? You're done! Don't overthink it. @Aladdin4d and @Triem23: Thanks! I wasn't sure if more should be done with it, so I'm glad to hear it works well as-is. Digging back into the archives again, this is a piece I made shortly after discovering HitFilm in the spring of 2015, made using HitFilm 2 Express. It gave me a chance to learn my way around the program, and also experiment with motion graphics animation (after years of doing almost nothing but 3D character animation). There are things I'd definitely do differently now that I've learned more, but I had fun making it. Ahhh... the good old days of doing local :30 spots! @jsbarrett, I'd day that's a pretty good first go for trying out a new program. I recently had to come up with a quick graphic and HF was pretty handy just to generate a quick image still by importing a couple of photos, create a gradient, add a logo, a little drop shadow, perspective on the photos, yadda yadda. There is a lot of power in this little piece of software. @Stargazer54: Absolutely! I tend to use HitFilm for most image editing these days, especially for anything that requires masking. I don't have Photoshop, so HitFilm is an excellent substitute. Got the bug to make a little animated Father's Day thing. Made completely in HitFilm Express 2017. The only thing I imported (aside from the music) was the flower-ish shape, but that was also made in HitFilm after watching one of the awesome tutorials by @AGArtsCo. I'm still shaking my head at myself, wondering why on earth I was calling it a pinwheel as I recorded the demo. I tried to have some fun at my own expense in editing, though, so I hope the humor comes across. Only thing that didn't look as high quality as the actual content (and therefore I would never normally have found about that content because of it...) is: the thumbnail. On a scale of Bleh to Yikes! it's around...."Umm...?" Thanks for the feedback, @Palacono. What exactly about the thumbnail turns you off? Oh, the humor shines out like a shaft of gold when all around is dark. Nice use of polar warp! Especially taking advantage of the reflection settings. My dumb self would probably have used other methods to make vertical stripes before Polar Warp. Elegant. Please note I'm just being direct because I'm an assh*le, it's easier to just brain dump my gut reaction and for you to pick out the good or bad as you see fit. To me it looks too simplistic and garish for anything beyond it to be worth examining. Time being precious....I have to ask myself: "is it worth the risk?" If you put a plain hardwood door on the entrance to Harrods and painted it green no one would ever go inside. Walnut Wood with ornate filigree around the edges and frosted glass with gold lettering = Come inside, High Quality Stuff In Here! There are whole tutorials on how to make a good thumbnail, Faces are good. Smiling faces better. Attractive Smiling Female Faces: best of all. If not that then something else that would allow people to judge the quality. Multiple mini-thumbnails of starbursts with different colours and black/white ratios? A gratuitous picture of your face going "Doh!" Nicer looking font, with Hitfilm in a different one to the 'content' and a Hitfilm Logo for people who speedread (or don't speak English)? Something that looks like it took 10 seconds to make implies that what ever is beyond it might also have taken the same amount of work and so is probably not up to much, so I'd usually have passed. Which would have been a shame because once inside the flimsy cardboard door with the creaky hinges: it's great! I do appreciate the directness. Sometimes I need that! Frankly, design isn't my strong suit, though once in a while I get lucky. As I mentioned elsewhere, I often lean toward simple and clean, but sometimes I may lean a bit too far in that direction, as in this case. Thankfully thumbnails (unlike full videos) can be replaced, so I'll work on something else when I have time. @Aidin who posts on here (hasn't been around for a while though) does great thumbnails. He even did a tutorial on how to make them. @Palacono JsbarretThumbnails ain't my strong suit either. At least I have a cool icon for the right side (the lower third bar is the HF4 logos--you can tell when Express or Pro are used by colors--tiled and trimmed. Come to think of it, time to rebuild that with the 2017 logos), but the main image is always a pain. I've seen that tutorial, and definitely like his thumbnails. As far as putting a face (i.e. mine) in the thumbnail, the question that comes to mind is: why? What relevance does my face have to my video content? With @Aidin 's stuff, it makes sense a lot of the time because he's on camera a lot. 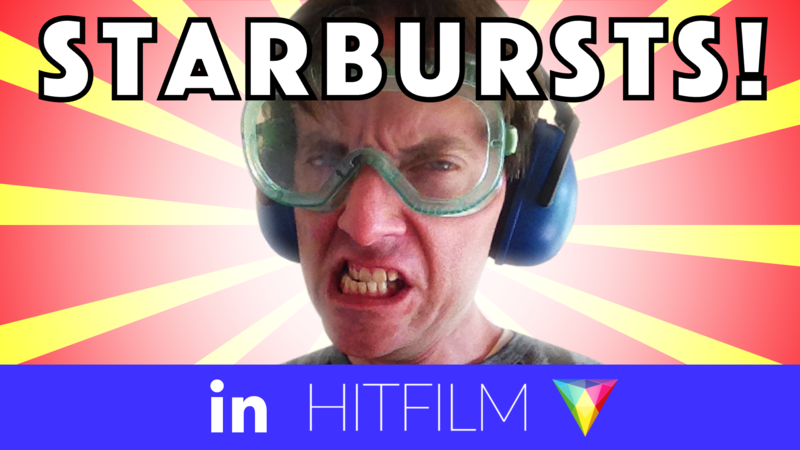 On the flip side, HitFilm almost always has a member of their team in the thumbnail, but that's because they also have on-camera elements to their videos as well as screen-captured footage. If what I'm showing is 100% screen capture, it's a stretch for me to think that I should include myself in the thumbnail. Perhaps that's the perfectionist/literal side of my personality coming through, but that's my thought process. Need to work on that, for sure. This whole discussion has given me an idea for a much more interesting thumbnail for this video. Will work on that after I get some other stuff done. It is psychologically proven that a face, smiling, eyes front engages viewers just about more than anything else other than possibly breasts. In my case I hate being on camera. Incidentally, it's also been shown getting the word "you" into the first five seconds of a video doubles retention, which is why all the Hit-U vids begin "If YOU want... you're in luck..." The one bit of psychological manipulation I use. It's not a requirement, people are just drawn to faces because :monkey brain. As you've established (or proto-established with one episode, but great start) that your channel has (and might continue to have?) a sense of humour, then if you're going to keep that up then a smiley face might be appropriate. That was just one of several things I threw at the wall. Doesn't have to stick though. At all. If it does: "Doh! I got the name wrong" this time, maybe "Hey, this is Cool!" Next time? I know it's hard to keep up, but same as "talking with a smile in your voice and on your face" helps voice overs: every little helps. Okay, here's what came out of my next bit of play. Thoughts? It's meant to be humorous, not truly angry. It's just a silly photo I dug out of my archives. That's fair enough... although you did ask for thoughts on a single image. If the context is humorous then sure it'll work well. It's certainly a improvement IMO. I'd probably click on that icon out of sheer curiosity. Although tonyg does touch on something with his (Freudian?) typo. Japanese flag, land of the rising sun etc. ? I watch videos at 1.5x speed (sometimes x2 if the presentation is particularly languid) and I was this far away from giving up on it at that point "Monkey Brain: OK, you made a mistake. Get to the good stuff..."
But then the word 'Play' and the 'differenced' '?' appeared followed by the blackboard sliding down "Monkey brain reaction:how did he write 'Hitfilm' so neatly with such thin lines? He's probably good at stuff!") and I was in for the ride. Honestly, the only other tiny thing was I thought that perhaps the first 'replacement audio' attempt was too subtle. Maybe more echoey, like it was recorded in the toilet? Or with a different inflection: questioning or robotic? Then the second one is more of an improvement, but it should also be 'wrong'. Too loud, or theatrical, or even sing-songy? "Staaar Suuun buuurst!" But I can definitely, definitely, over-analyze stuff to death; so if moving on is a better strategy, go with that. @jsbarrett Don't know if you seen this from the guys over at Corridor digital, but they talk a bit about thumbnails and making them. Might help. Sorry link won't let me paste time for state, goto 1:23 for the relevant bit. @Palacono ;I'll still take all notes and consider them when making future videos, but all I'm looking to do right now is get a thumbnail image that works. If the second one I posted isn't a definite winner, then I'll go back to the drawing board, but honestly, I'm getting a little frustrated at this point because I'm running low on both ideas and time. @Andy001z Thanks for the tip!